On 14 October this year, Pope Francis declared Archbishop Oscar Romero a saint. It was an outcome that many had been praying for over many years, since Archbishop Romero’s murder at the hands of government-backed death squads in El Salvador in 1980. Those who had been anxious that such a recognition would be an implicit papal blessing of liberation theology – and thus of a leftist political agenda – had successfully held things up; though you might think that a bishop killed at his altar after protesting about the murderously brutal treatment of the poor was a reasonably secure candidate for sanctity. Pope Francis is known to have made this a personal campaign, and there was a palpable sense in Rome that – at a time when Francis is somewhat beleaguered and heavily criticised in the Roman Catholic Church – the canonisation was a defiant affirmation of what is most important to him. But this is not about a political agenda, not even a church-political one. What is striking about Romero is that his preaching makes it crystal clear that he held to a strongly, uncompromisingly integrated view of Christian identity, in which personal faith and spiritual discipline were the foundation of public justice. A couple of weeks before he was assassinated, he delivered a lengthy discourse on the way the Church must serve the cause of “transcendence”: not a transcendence that removes us from concern with the immediate social crisis, but what he calls a connectedness with our own origins. Without discovering and nourishing this connectedness, we are not at one with ourselves, and we drift into “ingratitude, faithlessness and hostility”. Part of this is discovering how to make sense of our suffering and our incapacity to make the change we want: suffering and helplessness, including the frustration of the compromised politician or priest struggling to find a way through the thorny tangles of a sophisticated modern tyranny, have to be re-imagined as a way into solidarity, a personal sense both of the common struggle with oppression and violence, and of a common hope. Hope, he says, cannot be just hope for “justice” in the abstract. It must be hope for what he calls “communion”. Only when we understand our own suffering as something that roots us more deeply in the awareness of a humanity we share are we in touch with the “transcendent”. Our reflection on and identification with the suffering of Jesus is not a morbid brooding on our status as victims but a discipline that reminds us of the mutuality we are made for. No one suffers alone, whatever they may sometimes feel: we are all implicated, all diminished by the suffering, all enlarged by the sharing. “Communion” is more than a warm sense of togetherness. It is the sharp recognition that no human being’s pain is just their business and none of mine. Romero is passionately eager to hold two things together: on the one hand, the pressingly urgent, costly task of building active and vocal resistance to a state that is both violent and sophisticated in its methods; on the other, an inner self-scrutiny born of quiet, attentive presence, which insists we never forget the connectedness with God that comes to light as we discover our connectedness with one other. Hostility, fear and injustice are all the result of losing touch with this fundamental fact of connection. We are always drawing on the life and gift of others, never independent in the crude sense of owing no one anything. Perhaps that is why Romero is a saint particularly relevant for this wretched decade in which the rhetoric of national and partisan identity, separation and protection has become the common coin of so much political talk on the left as well as the right. The fierce assertion of who I am, the self I have the right to defend at any price, is understandable as the outcome of suppression and marginalisation. But if Romero is right, real “justice” only arrives when this is transcended – when we allow ourselves to recognise that our own security and liberation cannot exist without recognition of the mutual connectedness of human creatures, the fragility they share. We might want to add today, this is a solidarity that we must learn to extend to the rest of Creation, as Pope Francis has spelled out eloquently in his encyclical on the environment. In a trip to Latin America in September for Christian Aid, I had the privilege of visiting projects that the charity supports and partners with in Brazil. It was not long before the Brazilian election put the clock back decades, witnessing to the power of resentment and the way in which vested interests can turn that resentment to powerful effect. It was also an illustration of how Christian voices can be used by these vested interests, with immense posters in Sao Paolo of Pentecostalist pastors endorsing the candidates of the far right. Not much of Romero’s transcendence there. But meanwhile, a small human rights centre in Sao Paolo continues to help funding and training for a project that gives homeless people the possibility of learning machine-tool skills in a factory environment, working with recycled materials, and another project that oversees what is in effect a massive squat in a disused hotel building, now accommodating more than 200 families, where there is a vigorous co-operative culture, sharing responsibility for child care, maintenance and security, and enforcing a rigorous policy against sexual violence. Speaking to one young woman, living in a room with four children under seven, my Brazilian colleague asked her if she wanted to send any message to the UK. She thought for a moment and said simply, “Love”. Nothing about how needy they all were or how frightened she was by the prospects of the election. It might have sounded sentimental if it hadn’t been spoken where it was spoken and by whom it was spoken. Transcendence, in Romero’s sense. A connection with the origins we share, in some creative gift we can’t easily imagine. 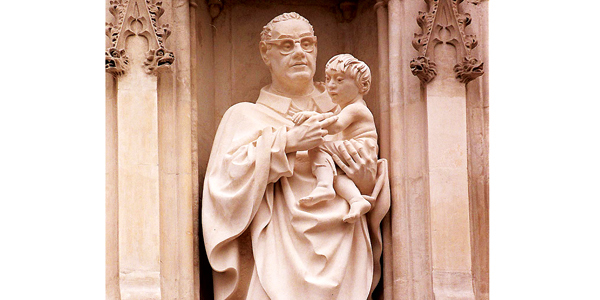 To mark the canonisation of St Oscar Romero, Evensong at Westminster Abbey today will include specially chosen readings and music. Rowan Williams, the former Archbishop of Canterbury, is the master of Magdalene College, Cambridge, and chair of Christian Aid. His most recent book is Christ the Heart of Creation, published by Bloomsbury at £25 (Tablet price, £22.50).